You are here: Home / Employee Engagement / Age of Conversation 2: Do You Get It? Age of Conversation 2: Do You Get It? Do you understand how conversations are changing not only the way we do work but the very way we understand our world? 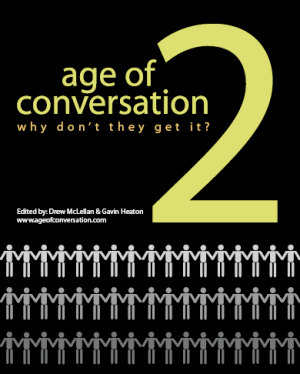 I am honored to be one of the many authors of the forthcoming Age of Conversation 2: Why Don’t They Get It. If you don’t understand the conversation or don’t know where to begin watch for the release of this book soon. All profits will be donated to the Vareity Children’s Charity. David, thank you for getting the word out about the Age of Conversation! I can’t wait to start reading it, and look forward to your chapter. David, I’m thrilled to see this title and can hardly wait for its release. At my company, we recently convinced our CEO to make a bold statement to managers: “There is no more critical obligation you have as a manager than to enable conversations.” I think he recognizes that today, business transformation can’t really occur unless smart people have a chance to talk to one another. Conversations are how problems are solved; conversations are how ideas are born. Let us know when we can order our copies! This looks like it’s going to be good. I think it will be a magnificent production and I will certainly let readers know as soon as it is available.